Photo illustration by Michael Xiao. What does it mean to be progressive on education issues? Eight years ago, when President Obama came into office, this was a hotly contested question. The Democratic Party was split into two camps. On one side were union allies, researchers, and policy-makers who argued that children’s academic performance would only improve with better-trained teachers, smaller class sizes, greater access to early-childhood education, and stronger antipoverty efforts. On the other side was the bipartisan education-reform movement. Its major achievement was No Child Left Behind, the law signed by George W. Bush in 2002, which required annual standardized testing in reading and math. By 2008, this camp was loudly promoting the idea that test scores should be used to evaluate and fire teachers. The movement’s leaders were crusading school superintendents like Joel Klein in New York City and Michelle Rhee in Washington, DC, as well as philanthropists like Bill Gates and Eli Broad. They wanted to increase the number of charter schools (which are generally not unionized), and they blamed union protections and school-district policies—not family poverty—for the achievement gap between poor and middle-class kids. Obama rose to prominence promising to bridge political divisions. When he announced in December 2008 that he would appoint Chicago schools CEO Arne Duncan as his secretary of education, the president-elect seemed to be staying true to form. In Chicago, Duncan had experimented with using student test scores to determine teacher pay and which schools to shut down, angering the local teachers union. Yet he was also a big proponent of quality early-childhood education, a rare source of consensus between the traditional and reformer camps. From the Archives: “Why I Changed My Mind” by Diane Ravitch, from the June 14, 2010, issue of The Nation. Once in office, Obama and Duncan funded some programs that unified groups across the progressive spectrum, such as improving the quality and size of state pre-K programs and renovating school buildings. But by and large, when it came to K–12 policy, the administration’s first six years were defined by an aggressive reform agenda that left the traditional camp, especially the teachers unions, playing defense. Only since 2014 has there been a détente in what many, myself included, termed the “teacher wars.” Grassroots activism from the Black Lives Matter movement, as well as from tens of thousands of parents who opted their children out of standardized testing, helped shift the terms of the debate. We now talk almost as much about school discipline, unequal school funding, and school segregation as we do about low test scores and teacher tenure. It’s a profound change in rhetoric. Had Hillary Clinton been elected president, new public policy could have flowed from this shift in priorities. But instead, Donald Trump is returning to ideas about education reform that now sound stale. He has chosen Betsy DeVos, a Republican fund-raiser and school-choice philanthropist, as his secretary of education. DeVos’s passion is redirecting public-school funding to vouchers that parents can use to pay for private-school tuition—a strategy that has little track record of improving student achievement. The holistic school-improvement agenda that President Obama embraced over the past two years is now on life support. This rhetoric was borrowed directly from the education-reform movement, which spoke often about the supposed power of great teaching to “overcome” poverty. In fact, according to research, at least three in-school factors impact student achievement about as much as teachers do: peer demographics (students learn more in a racially and socioeconomically diverse classroom); the effectiveness of the school’s principal; and the level of funding. Out-of-school factors, like the socioeconomic status of the parents and the safety and income level of the family’s neighborhood, outweigh the impacts of all in-school factors added together. 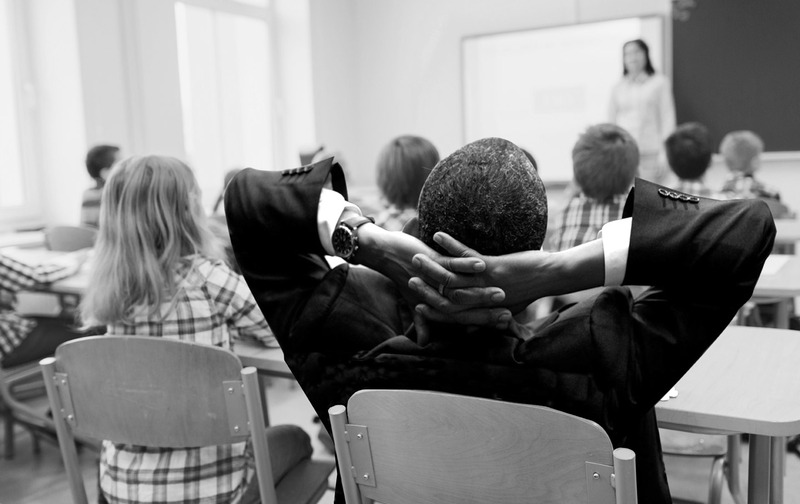 Those nuances were not, at first, reflected in Obama’s school-reform agenda. Race to the Top told states and school districts that if they wanted a share of the $4 billion in discretionary federal dollars, they would need to evaluate teachers using “evidence of student learning” (generally, test scores). They would also need to weaken tenure protections to remove underperforming teachers; lift caps on the number of independently operated charter schools allowed to open; and “turn around” failing schools, sometimes by removing veteran teachers and principals or handing the schools over to charter operators. There were no new federal incentives for desegregating schools, or for equalizing funding between those that served rich and poor children. Amid the recession, local governments were desperate for a cash infusion from Washington. More than half of the states in the nation changed their education laws in response to Obama’s incentives. Arguably the biggest change was in the way principals evaluated teachers’ work. Previously, many teachers had received only a single, cursory classroom observation each year. New state laws required principals to observe teachers’ work more frequently. Teachers have been asked to reflect more deeply on their practice and strive to improve. There has been a revival of interest in cooperative lesson planning, in which teachers work in teams, and in peer review, in which mentor teachers coach novices. These are good things. But Obama’s teacher-evaluation push also led to an explosion of standardized testing, in order to gather the “student data” needed to judge teachers’ work. I traveled to Colorado in the fall of 2010, where a new state law required 50 percent of every teacher’s evaluation score to be based on student-achievement data. In Harrison School District 2, a low-income, largely Latino district in Colorado Springs, children as young as 6 were taking pencil-and-paper tests in gym, art, and music. As many as 25 days per school year were spent on testing, a number that would soon become commonplace nationwide. A year later, I told Secretary Duncan at a private meeting with education writers about a physical-education test that second-graders had taken in Harrison, in which they were asked to draw a picture of two hands catching a ball. Gym teachers were being evaluated and paid according to how well 7-year-olds could do that. Duncan looked concerned and told me that the administration had never intended schools to adopt such narrow and hastily conceived testing policies. Nonetheless, the unintended consequences of the administration’s teacher-evaluation push continued to pile up. Many school districts dealt with the lack of quality standardized tests in science, history, the arts, and the early grades by using third- through eighth-grade reading and math scores to evaluate teachers of other subjects and grade levels. The rationale was that all teachers’ efforts eventually contribute to a student’s future test scores in reading and math. Testing experts decried that practice, called “shared attribution,” as totally unscientific. Given these absurdities, no one should have been surprised by the growth of a vibrant “opt-out” movement driven by educators and upper-middle-class parents. In July 2014, delegates to the annual conference of the National Education Association, the nation’s largest teachers union, passed a resolution asking Duncan to resign, and launched a campaign to end what they called “toxic testing.” In New York in 2015, 20 percent of students opted out of the end-of-year tests tied to the new Common Core standards in English and math—another controversial priority of the education-reform movement. The Black Lives Matter movement helped shift the national conversation on education reform. The Obama administration didn’t create the Common Core. It was launched in 2008 by a bipartisan coalition of governors and philanthropists, and it had a laudable goal: to create a rigorous set of curriculum standards that could be shared across all 50 states. To support the effort, Obama invested $350 million to develop new tests tied to these standards. Many of the tests were produced by for-profit companies like Pearson. In response, activists on the left began to echo a long-running call from the right to do away with the Common Core entirely. While the Tea Party—and later Trump—saw it as a classic example of federal overreach, the left argued that the Common Core caused stress for children while narrowing the curriculum to the questions asked on low-quality exams. Testing also came under attack after journalists and government investigators revealed evidence of standardized-test cheating in at least 40 states. The most infamous case was in Atlanta, where employees across the district corrected students’ answer sheets and then earned financial bonuses for high scores. Finally, in the fall of 2015, the Obama administration released new guidance to the states on how to reduce and improve testing. “In too many schools, there is unnecessary testing and not enough clarity of purpose applied to the task of assessing students, consuming too much instructional time and creating undue stress for educators and students,” the Department of Education stated. “The Administration bears some of the responsibility for this, and we are committed to being part of the solution.” A few months later, Obama signed the Every Student Succeeds Act, which replaced No Child Left Behind. ESSA continues to require annual testing in reading and math, but removes pressure for all teachers to be evaluated using student test scores. The law asks states to judge school quality in new ways, by considering student-discipline policies and whether all kids have access to advanced courses. With new research showing that poor children who attend schools with higher per-pupil funding outperform those whose schools have less cash, Obama has also sought to influence how states and municipalities fund schools. This year, he proposed a regulation that would withhold ESSA money from states and school districts that send more local dollars to schools serving affluent children than poor ones. Congressional Republicans and many local education officials from both parties are resisting the regulation, known as “supplement, not supplant.” It is simply impossible to imagine President-elect Trump, who campaigned on the premise of local control of education, continuing Obama’s fight on this front. Also at risk are victories in the area of college policy. In 2010, the administration pushed a major student-loan reform through Congress, removing for-profit middlemen so that the federal government provides more cost-effective loans directly to students. The administration also increased the income-based repayment of student loans and loan forgiveness for graduates who choose careers in the public interest. In the second term, Obama’s “gainful employment” rule has spelled disaster for predatory for-profit colleges. Under this regulation, for-profit colleges whose graduates are unable to find work are no longer able to accept students who rely on Pell grants. Hundreds of low-quality schools have gone out of business, and hundreds more are on life support. The cost of college, however, has continued to skyrocket over the past eight years, even at public universities. That issue drove Bernie Sanders’s presidential campaign and led Hillary Clinton to propose free in-state public-college tuition for students from families earning under $125,000. Trump has spoken often about college affordability, acknowledging that “students are choking on those loans.” He has promised to cap repayments at 12.5 percent of a borrower’s income and forgive loans after 15 years—a plan very similar to the one Obama already has in place. Even so, it’s difficult to envision Trump holding for-profit schools accountable for their dismal outcomes. After all, he paid $25 million to settle lawsuits accusing him of defrauding students enrolled in his own Trump University. More likely, he will seek to help for-profit schools reestablish their foothold while attacking traditional nonprofit institutions—those colleges most associated with the cultural “elite” he and his supporters ridicule. Trump has said that he would require wealthy universities to spend more of their endowments on student services and less on administration, or risk losing their tax-exempt status. This would do little to touch the lives of low-income students, who generally attend colleges without significant endowments. In August 2014, police in Ferguson, Missouri, shot and killed Michael Brown, an unarmed black teenager who had recently graduated from a segre­gated high school. The Black Lives Matter movement rose to national prominence. New cell-phone videos of violent encounters between black citizens and police emerged at a rapid clip. Four months later, Obama created a task force to examine policing. Though less noted among its victories, this police-accountability movement also helped shift the national conversation on education reform. Since the school shootings of the 1990s, the number of police officers working in schools has exploded, due in part to federal funding earmarked for hiring so-called “school resource officers.” In 1975, 1 percent of American schools reported a police officer working on campus, compared with 21 percent of schools in 2008. Schools with police officers are more likely to report students to law enforcement for ordinary infractions like student fights. Even when the police are not involved, students of color and disabled students are more likely to be suspended or expelled than white and nondisabled students who commit identical behavioral infractions. Organizations like the ACLU and the Southern Poverty Law Center had long been working on these issues, and the Obama administration picked up the torch. In 2014, the Education and Justice departments released new guidelines on school discipline, directing states and districts to end racial disparities in their suspension rates and to use restorative-justice practices and counseling to address student misbehavior. The expansion of charter schools seems likely to be the most lasting of Obama’s education reforms. With Republicans set to control all three branches of government, Washington will likely play no role in school-discipline reform or school desegregation. Progressive efforts on those issues will devolve entirely to states and cities. Considering Trump’s law-and-order rhetoric and support from police associations, he could even seek to expand the role of police in schools. He could also choose to end the Obama administration’s efforts to collect new types of data on racial disparities in education, such as suspension rates and bullying incidents. The expansion of the charter-school sector seems likely to be the most lasting of Obama’s education reforms. When the president came into office, 1.6 million American children were enrolled in charter schools; in 2014, that number was 2.5 million, or 5 percent of the public-school population. While there is no grassroots constituency for standardized testing or punitive teacher evaluations—policies that educators, parents, and students generally dislike—decent charter schools create advocates the moment they open their doors. Parents and communities fight hard for the schools in which they enroll their kids, even when those schools are flawed. Yet the charter movement has had trouble developing a base of support beyond the families its schools serve. On November 8, Massachusetts voters overwhelmingly rejected a ballot initiative that would have expanded the number of charter schools, even though the state’s charter-school sector is among the nation’s highest- performing. And in October, the NAACP’s board of directors approved a statement opposing charter schools. While charter schools are divisive among progressives, they will remain central to conservative policy-making. Trump’s boldest education idea is a $20 billion federal program to fund local school-choice efforts: charters, magnet schools, and private-school vouchers. He has not said exactly where this enormous amount of money—five times the size of Race to the Top—would come from, but presumably it would entail raiding Title I, the civil-rights program that, since 1965, has directed federal dollars to schools that serve large numbers of poor children. A decade ago, I began my career as an education reporter worried that problems like segregation and unequal school funding were being ignored in favor of small-bore reforms on teacher tenure and merit pay. So I’ve welcomed the Obama administration’s shifts over the last two years. Now, under Trump, we are about to experience severe education-policy whiplash. What’s virtually certain is that a limited Trumpian agenda of school choice and confronting teachers unions will fail to close achievement gaps—after all, these policies have never been silver bullets in the past—and this will further feed notions of the public schools as failure factories. What’s more, if congressional Republicans succeed in decimating the social safety net, the resulting increase in child poverty will also negatively impact academic outcomes. On the other hand, nearly 90 percent of school funding comes from state and municipal governments. If progressive education advocacy—on desegregation, fair funding, and equal access to strong teachers and rich curriculums—is to be effective over the next several years, it will have to focus strategically on statehouses, school boards, city councils, and mayoral races.